The Modern Mughal Mentality transforms hardships and difficulties into success stories by introducing the Jugaad Management Principle Business Model, which can be applied to any business, anywhere. For the purpose of this book, the term Jugaad will be defined as obtaining your objectives by maximizing resources through thinking out of the box. It also reveals ways in which western companies can learn to be successful in India. Executives of multi-national corporations, government officials, and even American and global small business owners who have no plans to do business in India will benefit from the innovative and revolutionary approach to maximizing resources that The Modern Mughal Mentality delivers. Here is Video Promo of the book. CarryonHarry Talk show will be conducting a focused talks about her book "The Modern Mughal Mentality:New Strategies to Succeed in India and the Global Marketplace" and also getting to know more about Dr.Afshan Naheed Hashmi life journey and things she has learnt over the years for us to understand her point of views about things that she would love to share with worldwide listeners of CarryOnHarry Show. 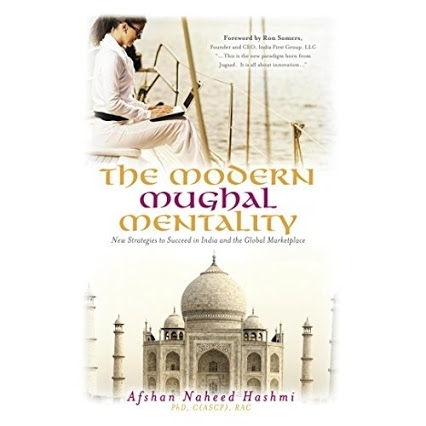 The Modern Mughal Mentality: New Strategies to Succeed in India and the Global Marketplace by Afshan Naheed Hashmi is an excellent guide to Jugaad management principles. The title implies the ability to think big, while Jugaad refers to the ability to proactively innovate and succeed in the face of difficult challenges. The business strategies cited in this book are based on having a genuine goal to achieve widespread success, understanding customers' needs well, systematically innovating methods to meet these needs in a cost effective way, and maintaining a practical but flexible attitude to business strategies. Hashmi describes India as a hotbed of creative ideas and talent when it comes to achieving successful business strategies based on systematic innovation. Citing examples from restaurants, automobile, medical, hotel, retailing, construction and other industries, she illustrates seven types of Jugaad business strategies: creative improvisation, globalisation, competitive advantage, reverse outsourcing, acquisition, frugal innovation and reverse innovation. These strategies illustrate how creative, insightful, adaptive and efficient Jugaad strategies have been adopted by many successful businesses globally. Jugaad is not limited to India and it has been successful in many developed countries. A key benefit of Jugaad strategies is the potential for win-win business ventures. For example, in many cases where Jugaad is applied, customers benefit by having their needs met and businesses benefit not only by an increase in sales, but also the potential for introducing the locally adapted product to a foreign market. Another benefit of Jugaad strategies is being able to advance in niche and underdeveloped markets and turn them into mainstream business ventures. A good example of this is fast food market entry strategies in India which adapted to suit the local taste and dietary requirements. Hashmi provides several interesting examples of Jugaad strategies and their outcomes, which she hopes will inspire people to transform business ideologies and bring fresh insight to strategies for market entry, customer satisfaction, outsourcing and resource conservation. In this book, she has captured the Indian spirit of adventure and optimism via her discussion of Jugaad business approaches, and asserts that Jugaad strategies can be powerful in resisting setbacks and economic downturn.